When you go to Ticketpro online, be sure to go to ticketpro.ca NOT ticketpro.com. These are two very different businesses. 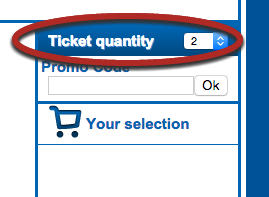 When you get to ticketpro.ca you’ll have a choice of 4 regions. You’ll want to choose Atlantic. 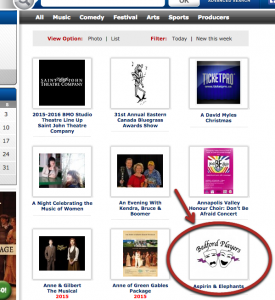 Scroll to find Bedford Players – or do a search at the top of the page. Select the date you wish to attend. Seat Map allows you to select your own seats. Automatic Selection allows you to indicate the number of tickets you want, and the system will suggest the best available seats. Part way down the screen, on the right you’ll see Ticket Quantity. Select the number of tickets you require. Enter a Pomo Code if you have one. Click on seat numbers to select seats. Note, the default is to provide you with seats in the same row. So, if you want seats in different rows, for example you want seats A1 & A2 as well as B1 & B2, choose quantity as 2 and select the first two, then add two more. When you make seat selections, you’ll be presented with a pricing pop up where you choose the appropriate price for each seat. In the right sidebar, you’ll see the seats appear in a list. You can edit or delete seats at this point. Provide the required information to complete your transaction.